The first edition of this book was written in 1961 when I was Morris Loeb Lecturer in Physics at Harvard. In the preface I wrote: "The problem faced by a beginner today is enormous. If he attempts to read a current article, he often finds that the first paragraph refers to an earlier paper on which the whole article is based, and with which the author naturally assumes familiarity. That reference in turn is based on another, so the hapless student finds himself in a seemingly endless retreat. 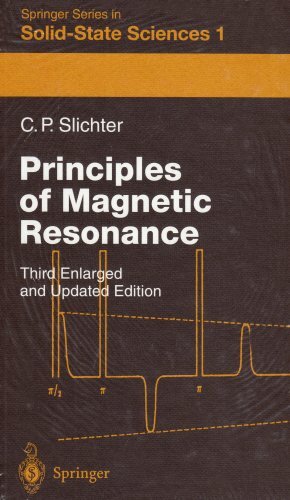 I have felt that graduate students or others beginning research in magnetic resonance needed a book which really went into the details of calculations, yet was aimed at the beginner rather than the expert. " The original goal was to treat only those topics that are essential to an understanding of the literature. Thus the goal was to be selective rather than comprehensive. With the passage of time, important new concepts were becoming so all-pervasive that I felt the need to add them. That led to the second edition, which Dr. Lotsch, Physics Editor of Springer-Verlag, encouraged me to write and which helped launch the Springer Series in Solid-State Sciences. Now, ten years later, that book (and its 1980 revised printing) is no longer available. Meanwhile, workers in magnetic resonance have continued to develop startling new insights.